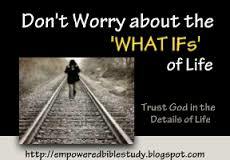 Here is an interesting topic: one I just had with my Son, the what ifs. Very deep in conversation about all the possibilities we’ve and those which did not manifest which could have been good or bad. Our faith and loving families all desire the best outcome, sometimes things are difficult and strenuous when seeking the best outcome. We must not get discouraged and feel false hope, there are things which will make us redefine our purpose and why God choose us and not someone else. Growing up is tough for most and for those who have figured it out the better for them and there families. We all learn and by correcting our mistakes along the way. We’re not perfect in any way, but with our whole heart and soul lead by example and set the tone. What if, we’d everything and all the money which could buy us everything we desired, would that make the what ifs better? I’ve read the poorest of people are in fact the happiest. Why is that a fact, some may say they have found happiness within their self and are grateful for the simplest things they have. I ask my self this question everyday, what if this illness had not effected my family, would things be different? It’s been a year now and I feel like things are getting better and my spirit is full and happiness is all around me. Things which we experience help us gather strength from each other in the time of need. Things are going to happen, it’s just part of life and we have no control over it. But what we do with those rocks in the road will define us for sure. Let’s not stop earning for the things we desire with faith and glory to the Lord. It’s because of him we are blessed in his spirit and healing hand for all to embrace. So as my Son and I had our conversation it’s amazing the things which have affected or changed the course of his path. We must understand now, and today to be thankful for what we have and should be grateful and prideful for having a roof over our heads and food to eat. The errors and wins will come, we must’n lose faith, but must continue to encourage ourself for more promising outcomes in the days ahead. To live in the what ifs, would be the same as looking for a pot of gold. It’s just not going to happen, there are no short cut in life and God has promised and will always be with you in the toughest times. Faith in Him and teaching others about him is what he asks of us, to help others and show them a better path and stop living in the what ifs. Live and be grateful for everything he has provided and follow in his footsteps and seek others to follow you in loving spirit. I have always says it’s too easy to be angry and frustrated, why put so must negative energy into our hearts and then our souls because our faces alone will tell the story. We must rise above it all and fight for the things which will bring us happiness and love. To smile is the greatest gift of all and demonstrating how it makes you feel. So stop getting angry and start believing, God will show you the correct path and you must follow him. There are no pills or drugs which can make you happy, and if so they’re but a Band-Aid trying to stop the bleeding of a severe cut. Believe in yourself and pick up the good vibes that are all around you, and put those things into your heart and see your face change. It’s the greatest feeling and enlightenment your spirit will ever need. It’s the best medicine on the planet and it’s free. So stop the what ifs, and start living for today and in the NOW. There are but only the obstacles we put in front of our own path which makes it that more difficult to walk. Use each stone as a step and walk over to the next and continue until your path is clear. Be thankful and embrace your life head-on and with direction and forcefulness, determination and lots of effort is only what God requires of US.